By Lisa Perkins, The Record Eagle: TRAVERSE CITY — The challenge of running 250 miles across Ethiopia seems small compared to the challenge of growing up there without an adequate education. A team of 10 athletes will take on both challenges when they travel to Ethiopia to run from the capital city of Addis Ababa to Yirgacheffe in an effort to raise funds to build three schools. 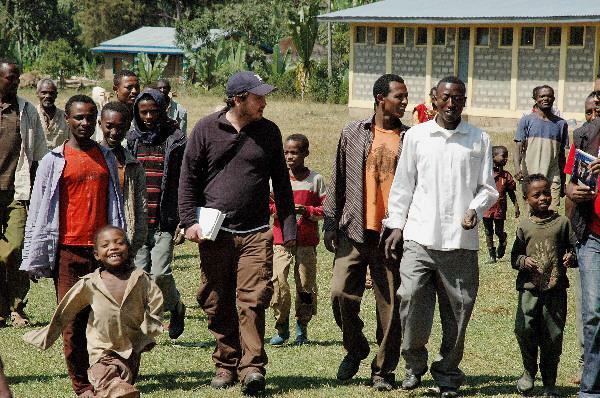 Run Across Ethiopia, sponsored by On the Ground, the nonprofit arm of the fair-trade coffee company Higher Grounds, will offer the opportunity for a better education to the communities that raise and harvest the beans sold by the Traverse City-based company. “We have committed to building two schools already, with a goal to raise $175,000 and be able to build three,” said Bill Palladino, executive director of On the Ground, the group that oversees and administers development projects in coffee growing communities. A school for girls is planned on the outskirts of Addis Ababa while two schools will be built in the coffee-growing region of Yirgacheffe. “Chris Treter, owner of Higher Grounds, travels around the world and sees the needs of the people that are picking the beans that he brings back to roast and sell,” Palladino said. Treter started the fair-trade coffee company to supply the highest-quality coffees from around the world while building a long-term relationship with the growers. “It has always been my intention to have a mission-based organization to support the growers and bring water, education and health care to those without it,” said Treter, who received an enthusiastic response when he proposed the idea for the run that will begin on Jan. 8. Six runners from northern Michigan, as well as four others from across the country, have made the commitment to run 25 miles each day for 10 days in southern Ethiopia. “To see the support we have received from our community, for these runners to make this type of commitment has been an amazing experience for me,” said Treter, who enlisted Timothy Fitzgerald Young, president of organic specialty foods company Food For Thought, to serve as team leader and logistics coordinator for the group of runners that includes Hans Voss, of Traverse City. Voss, who has traveled extensively in developing areas across the world, says he was compelled by the power of Treter’s idea and loves a great challenge. “This is a direct, hands-on way to bring a thing of tangible value to these children,” Voss said. In addition to the running team, the musical duo of Seth Bernard and May Erlewine will serve as musical ambassadors for the trip. “They will be an advance team, showing up in villages before the runners to play music and entertain schoolchildren, opening the doors,” said Palladino, noting that the singer/songwriters will collect sounds and experiences to create an album upon their return. Half of the profits from the album will go to On the Ground. A Run Across Ethiopia fund-raising trunk show and silent auction will be held from 10 a.m. to 4 p.m., Saturday, Dec. 11 at Higher Grounds Trading Company, 806 Red Drive in The Village Commons.